Food has the power to bring strangers together and to open doors that once were closed. That has been Eleanor Moreno’s experience through her work with her Co2 storytelling project in Grand Rapids. Co2 aims to provide a platform for people to make their voices heard, engaging people to collect stories in their community that share their hopes and frustrations. Through a team of story collectors, Co2 gathers stories from people in the neighborhood and then brings those concerns to people in power in the effort to push for change. While Co2’s intent is not necessarily to gather food stories, their harvest often does include plenty of stories about food, and how food builds and strengthens connections between people. One day, a storyteller called Moreno to share a family’s concern about how the information was going to be used, and he asked her to come to the family’s house. 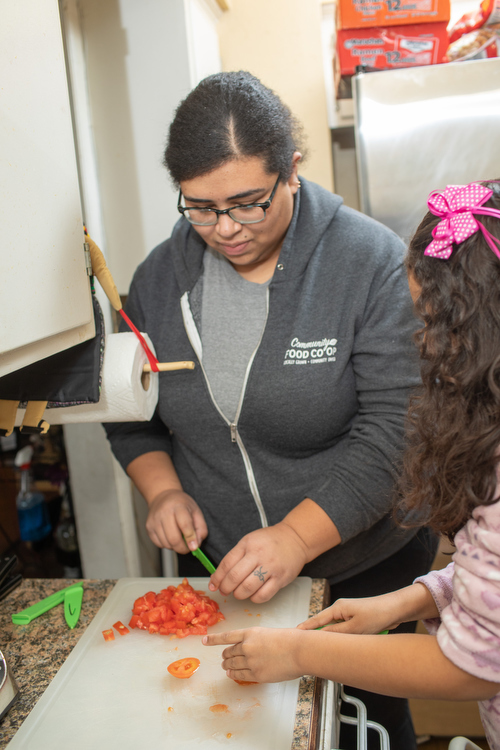 In the current political climate, the mother of the family thought the effort was immigration-related, so Moreno talked with her about how her group simply wanted to know about changes the mom and other neighbors would like to see in their community. 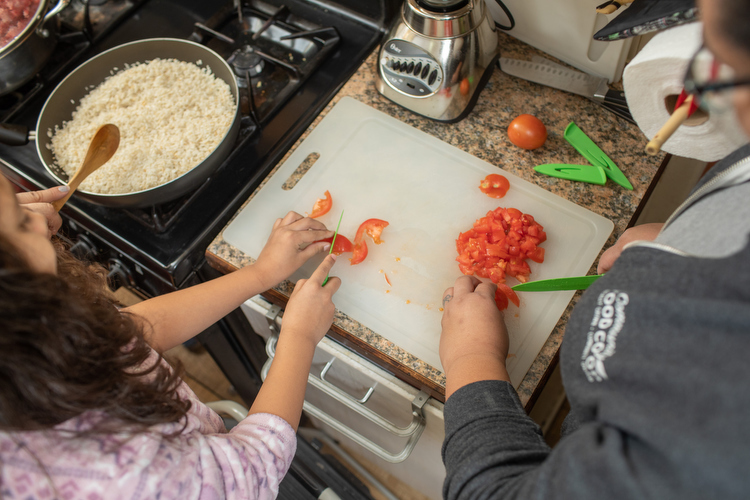 Eleanor Moreno connects with her family and her community by sharing food and stories about food. The mom invited Moreno to come back to the following weekend. When she returned, they laughed and deepened their connection over cookies. The mom, an immigrant from Guatemala, talked about the lack of access to culturally relevant foods and about how her kids just eat fast food now. That turned into a conversation about food access and the community garden. The experience impacted their story collection methodology and reinforced the importance of continuing the work, says Moreno, who has worked in the nonprofit sector for the past 10 years. Monthly socials grew out of the story collecting. At one social, one of Moreno’s neighbors shared a story about how his Mexican village would have a party. Someone would kill and roast a pig or a sheep. People would come and there would be music. He was missing that feeling of community in Grand Rapids, and wanted to feel that again. He sparked an idea to throw a similar celebration in December and have a pig roast around the holidays, complete with blue corn tortillas made by hand like his grandma and great aunt used to do. “We've all talked about how food is so important to us. … Just about all of us come from backgrounds that we've all faced poverty. Our communities are known for being marginalized and not having a lot of wealth. So it's interesting that we just have all this commonality around food,” Moreno says. As one community focuses on storytelling to strengthen their shared experiences through food, another community far across the state educates its youngest members about how indigenous peoples farmed and fished the Upper Peninsula landscape. At Joseph K. Lumsden Bahweting School in Sault Ste. Marie, students participate in an annual Boat to School week that entails cooking lessons and visits to local fisheries to explore how local fish makes it to their plates. They went to the fish hatchery in the Upper Peninsula town of Brimley to watch how walleye were tagged and met with local fishermen. Later that week the students went to St. Ignace to watch the fish being cleaned. It culminated with the students eating fish tacos for lunch. These activities aim to help the students see things full circle. “I think the kids are much more likely to try something when they've had a role in part of the process. Fish tacos [are something] I think many of our kids have not tried previously. When they can see everything that goes into it, they're more interested and excited,” Principal Lynn Methner says. Connecting the students to local Ojibwe culture doesn’t just happen during one week during the spring. During the fall, traditional Native American dishes are prepared for the family feast event where there’s wild rice, smoked fish, venison and more. During middle school fall camp, students cook bannock, bread dough roasted on a stick. Kids roast the bannock themselves over a fire in the woods. Communities across Michigan are sharing farm fresh foods to connect to each other. The school has also had a garden where the Three Sisters crops (squash, corn and beans) are grown. When there’s enough to harvest to serve at lunch, the produce from the garden has made its way to school lunches. Whether intentional or not, these school programs contribute in part to the six goals of the Michigan Good Food Charter, a roadmap aimed at increasing community access to Michigan-grown foods. By incorporating locally-grown foods into the school cafeteria, by providing education about how Michigan food is grown or caught, and by offering insight into the entrepreneurial side of agribusiness, JKL Bahweting School, like many Michigan educational facilities, is strengthening Michigan’s food ecosystem and connecting its student body to local Michigan native culture at the same time. “Our philosophy is trying to make learning as hands on as possible for our students. Approximately 65 percent of our students are Native American. So we really try to incorporate as much of the local Ojibwe culture as possible,” says Methner. 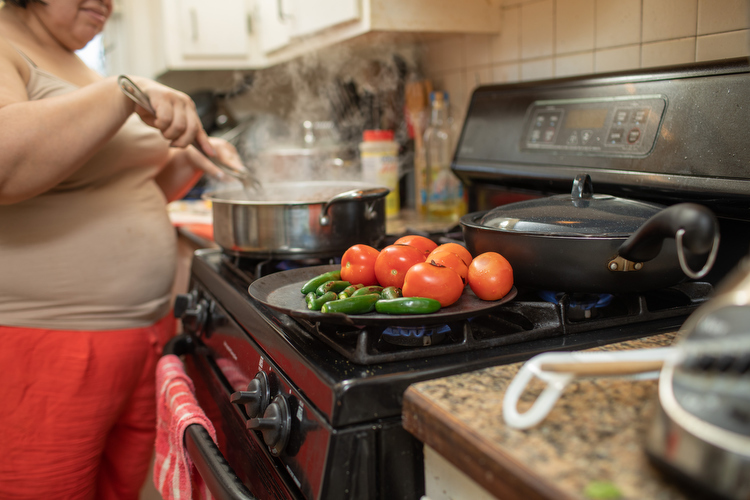 In an urban neighborhood, food is connecting women from across the globe to a new life in Detroit, and to new friendships. But what remains a consistent thread is the importance of food to sustain health and to strengthen bonds in a growing community rich in diverse cultures. Minara Begum has been cooking since she was 9 and gardening when she was even younger, at age 5. In Bangladesh, where she’s from, both skills are ingrained at a young age because extended families will all live under one roof, so there’s always a lot of people to feed. So when she came to Detroit three years ago, she continued to garden and cook. In the first year she and her family, which includes five children, were struggling: they were waiting on their green cards and Social Security cards. “I came here with all these hopes and dreams, to have a better life, but I figured that I needed to do something about it too, versus kind of just waiting around for that better life to just happen,” Begum says through an interpreter. She was looking for a way to have financial security and make sure her family was able to thrive in their new home. That’s when she met her neighbor Emily Staugaitis, a New York native who came to Michigan to study at Cranbrook Academy of Art, where she eventually became assistant curator. The two struck up a fast friendship. Begum and Staugaitis didn’t speak each other’s languages but were able to communicate through food by pointing at things and repeating the words in their respective languages. Begum and Staugaitis then started collaborating on what would become Bandhu Gardens, a network of women cooks and gardeners in their Detroit neighborhood who sell their surplus long beans, bitter melon, taro leaves and other South Asian crops to restaurants. This past year they sold vegetables to restaurants such as Supino Pizzeria and Rose’s Fine Food, and their winter squash was included in Keep Growing Detroit’s CSA share. They’ve also done pop-up dinners and catering, such as an event at the Museum of Contemporary Art Detroit in January. They hope to expand with a Bandhu Gardens hub and kitchen in a house that Staugaitis bought as an investment to create a permanent space for the Banglatown community. When older generations share foods with younger generations, they share their culture too. While the women gardeners and cooks were already connected to their culture, Bandhu Gardens has helped not only continue those traditions across generations but also bridge the gap between the Detroit foodie scene, which can be predominantly white chef-driven, and the Bangladeshi community.